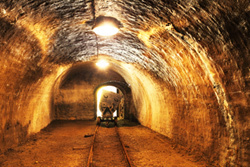 The processing of highly valuable mineral resources is marked by an increasing demand of a growing number of future-oriented industries, like electronics, automotive or solar components. Besides the prevailing economical crisis and the huge demand for resources, this is impacting heavily on gold prices and other semi precious metals. Further more ecological requirements and process optimisation in terms of consumption of resources, water and energy are constantly increasing. 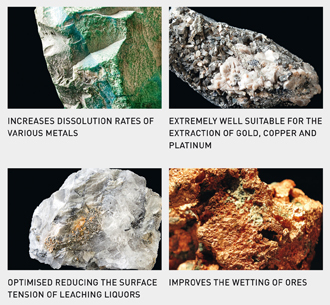 With its comprehensive know-how of “Smart Chemistry with Character“ the CHT Group aims at contributing innovative solutions as well as technologies for cost-effective processes and ultimately a competitive extraction of those precious metals like gold, platinum and copper. We developed with KOLLASOL STG a non-foaming wetting agent, that perfectly meets these requirements. Besides an increasing yielding, KOLLASOL STG allows the reduction of toxic and harmful chemicals like cyanides. It creates added value in two ways: as part of heap leaching and ﬂotation processes. With KOLLASOL STG addition in the process, surface tension of the mineral / ore is drastically reduced and optimally prepared for the absorption of the co-collector and other reagents.